I used elements from Mischief Circus and me. Yesterday I went on a trip with my buddy G.
the ski-slope and the little mountain resort. More than a million people visit yearly. Amazing art, digital and handmade and a super fun indoor wintersport resort - just amazing - looking forwrd to see more photos! Loved this head art too! Your Singing in the Rain lady is delightful - such a happy vibe. dein Kopf ist phänomenal ich find ihn immer grossartig was da alles so drin ist! das Journal fürs chris Thema ist wunderschön!!! Nah und Neusserskihalle wenns da richtig los geht an den Tagen da wird gefeiert was nur geht und Ski und Skatebord gefahren. Mein Sohn war begeistert. Klasse Fotos hast du mitgebracht von dort und mit dem kleinen süssen Jungen. Fun journal pages. The faces made me smile. And the girl with the umbrella has given me an earworm to sing for the day. Thanks a lot. =^,.^= The indoor Alpine ski resort is Wow! Love the architecture and even though a little too early, the Christmas decorations. No skiing for me. I'll just sit in the cafe and have a cup of tea with strudel. Have a great day. That's exactly what I did, I like watching people in the snow, but that's where it ends! What an interesting resort! Nice look inside your head for PPF and a lovely warm page for AJJ. Wonderful photos Valerie, and beautiful art as always! Two fabulous art pieces Valerie (and I love the new blog header)! And oh my goodness, what an amazing place there in Neuss, fantastic photos, though yes I can imagine it must have been a bit surreal, but it all looks so cosy, would love to visit there one day.... Looking forward to more photos! There are alot of interesting people in your head today Valerie, I hope they all get on well together and are a quiet happy bunch of folk and don't give you a headache. The girl with the umbrella looks very happy out in the rain, its another fabulous page. Neuss looks a wonderful place to visit, You can see by looking at your photos why people are attracted to go there. Watching the folk on the ski slope while having a coffee would be a plus for me as well. I just love your new header, it's great! This looks such a good place, you've shared some lovely photographs again. We don't have any snow in the valley. But it sure is raining in North Idaho. I love that you always give us a glimpse of your world! Hi Valerie. I love your great card. It is really very clever image. I am glad you had a lovely time, my friend. I LOVE snow! Kisses! I like your beautiful new header and these photos are wonderful. Love that head and your quote is quite true. People nowadays never stop. They run around at one hundred miles an hour and often miss what's right in front of them. Wonderful piece, I so agree with the quote you used! Your hybrid piece is fantastic! Love that ski resort, wow! So festive and grand! I've never seen a place like this before, must have been a great experience! Great art this week, Valerie. I especially love the piece you did for "101 ways to warm. The colors are warm and wonderful. I had never heard of an indoor ski resort before. I will click on the link to read about this. Happy PPF. The singing in the rain artwork is very cheerful and a terrific reminder of one of my all-time favorite singing-and-dancing movie scenes. The indoor ski resort is really cool. The only one I'd heard of before is in Dubai, which struck me as rather strange, considering the climate there. Not too far from me at a place called Stone Mountain (Yeah, I know. Not very original...) is an outdoor snow area. The day they started creating the artificial snow for it this year was eighty degrees. Having grown up in a place where we saw more than enough snow, we've never visited this fake winter wonderland, but with our mild winters, I imagine that snow must be really wet. a delightful post! Great sentiment on the first project. 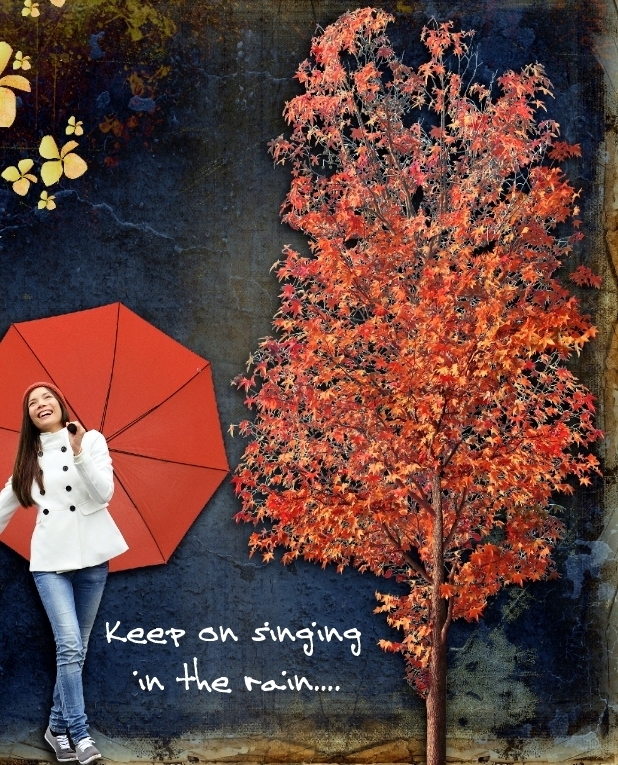 And I love the happy feel of the second page and singing in the rain. Happy PPF! Wonderful and magical post..I am smitten with "the singing in the rain", fabulous and beautiful art! Gorgeous! Our heads can definitely be busy places, it's a wonderful painting. I also love "Singing in the Rain." What an amazing place to visit as well. I rather like this journey inside your head! And the market! Your new header looks great. Happy weekend! Interesting look inside your head! That lady in the hybrid piece certainly looks like she's enjoying the rain ;-) Happy PPF! Hi Valerie. There is an award for you, my friend, on my blog! Kisses! Hope its not too noisy in your head and they take note of the quote. 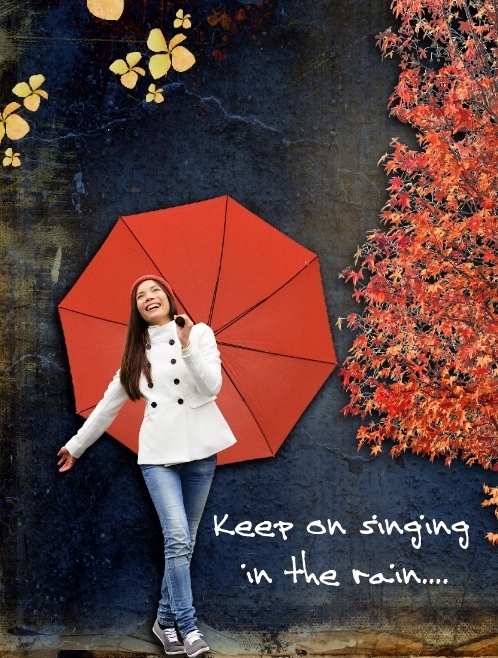 Love the singing in the rain page. The ski centre looks fantastic, especially if you can sit and watch and be warm, while drinking your coffee . Wow- love both of your pieces. I like getting to peak inside your head. :) Great quote! The ski center looks like a great place to visit. Lots to see and do! Haha! I am loving the look inside your head. It totally made me laugh. WOW! Really? They have enclosed the whole ski area?? I would like to see an outside photo as well- that is just incredible!!! Hahaa Great pieces of art Valerie!! I love all of the people in your head! But have to ask, what is that silhouette boy doing? I could not figure it? 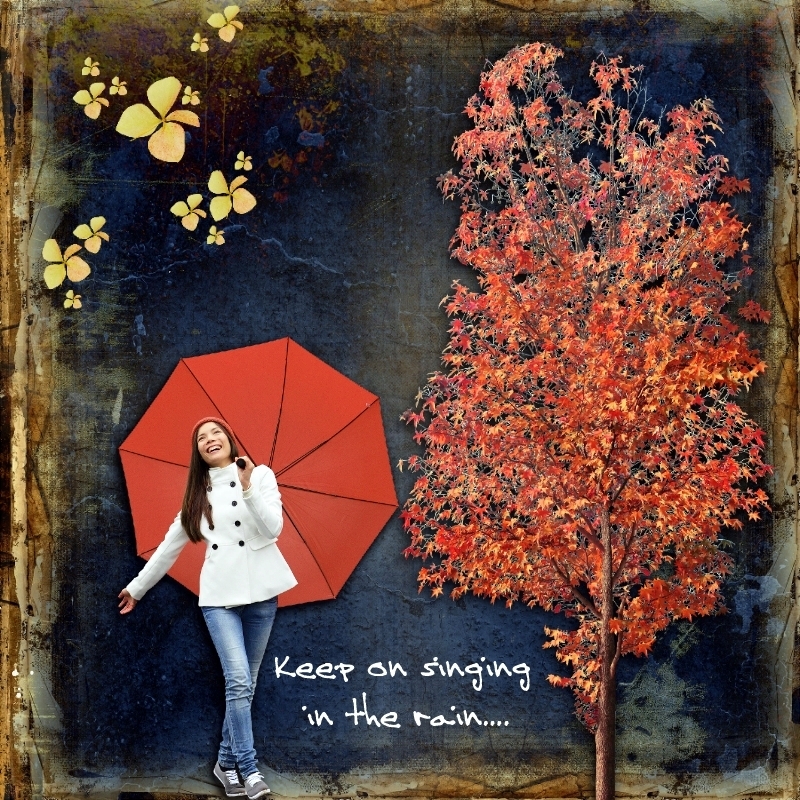 Love the singing in the rain as well! Both art pieces are wonderful! I love them! The words you used on both pieces touched my soul! Thank you! I want to go to this inside ski place! WOW! It is really amazing! How cool!!! !